Goel Ganga Group is a well-known name in the Pune market but they have been a distant cry from where Kolte Patil and Marvel have found themselves in terms of popularity and home ownership, although with the Arcadia, Florentina, Platino, Glitz they have been making their presence felt their competition has been on the run creating masterpieces. With multiple live projects, it is perhaps Goel Ganga’s turn to bring itself back in the leading developer space in Pune. Advantages of Undri as a destination are well known, the railway station is about 8 km away and Pune Airport about 12 km away. As far as public transport is concerned, Undri is served by PMPML buses and shared autos that regularly ply on this route. To improve connectivity, the Katraj-Kondhwa-Phursungi-Solapur highway is in the process of widening up to 60 metres. To ease traffic congestion on Pune and Pimpri - Chinchwad roads, the state government has proposed the 170-kilometre long Pune Ring Road project. On completion, this ring road will be interconnected with highways like Mumbai-Pune-Solapur, Pune-Satara, Pune-Nashik and Pune-Ahmednagar. It will be a 6-lane road with two service lanes and will connect fringes of Lonikand, Undri, Pashan, Baner, Wakad and Dehu. This project will be completed in four phases. We remember apartments in Sparsh at Goel Ganga (the phase 1 of the undri project) were available at roughly 27 lac. In the last 4 years, many projects have cropped up in this (read Astonia Classic by Amit enterprises, Godrej Prana by Godrej Properties, Kolte Patil) suburb o Pune. It would be fair to note that from being an investment destination Undri is fast turning into a residential hub. More than 40 projects are currently under construction. Due to its to ever improving infrastructure, social infrastructure and enhanced connectivity, Undri will always be in great demand from an investment perspective. All these factors indicate that buying residential properties in Undri will fetch good returns in the near future. And that’s where the challenge lies for developers since now consumers will look beyond pricing, beyond marketing campaigns and will compare products. So let's quickly deep dive into the product and see whether the same passes the litmus test. Right opposite Ganga Sparsh stands Ganga Elika which has three blocks with eight storeys each. It's kind of an extension of the same complex with a different name. The master plan above is just ok. Views from the building which faces Ganga Sparsh will be blocked so be careful while choosing your apartment. 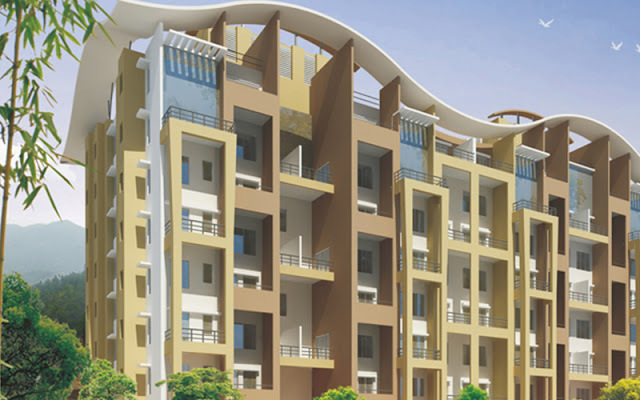 Each Block offers 2BHK & 3BHK apartments suiting to your need. 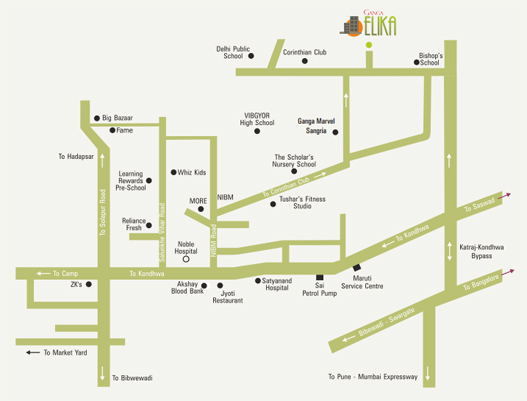 Apartments at Elika are spacious ranging between 900-980 sqft. Well, he product as such is pretty ok, the apartments are cladded with vitrified flooring and the apartment promises to have facilities like exclusive external decorative colored finish in superior waterproof quality acrylic cement paint, premium toilet & bathroom fittings which are hygiene factors. Nothing special to say the least.There are 4 apartments per floor, we will be evaluating the 2 BHK layout plan here. Lets state it upfront, we like the design. The entrance foyer in the apartment ensures complete privacy. No outsider can intrude your privacy thanks to the design and planning of this space. The living room though small is size has an attached deck with gives the apartment a grand feel. The bedrooms are sized well however we would have preferred if the common toilet was not so close to the master bedroom. The highlight of the apartment is the deck. There are decks in the living and master beds which are good enough in size to be converted into a private garden. We like what we see however Goel Ganga should work on consumer complaints. If you are looking at investing in Undri do evaluate all players before taking a final call.